The SEC accused Ramapo, N.Y. (“Ramapo”), its local development corporation, and four town officials with engaging in a municipal town bond fraud. The SEC alleged that the four officials hid Ramapo’s deteriorating financial situation from municipal bond investors. 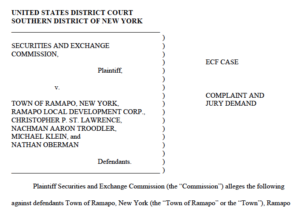 In its court Complaint, the SEC charged Christopher P. St. Lawrence, Nachman Aaron Troodler, Michael Klein, and Nathan Oberman, with committing public statement fraud by making numerous false or misleading statements and omissions about the financial condition of the Town of Ramapo and the Ramapo Local Development Corporation (“RLDC”) in connection with 16 municipal securities offerings between September 2010 and September 2015. According to the SEC, in 2010, the Town of Ramapo and the RLDC set out to build a minor league baseball stadium, later named Provident Bank Park. Politically, this turned out to be an unpopular municipal project. It cost at least $60 million to construct, and immediately began to put a strain on Ramapo’s finances, which were already impaired by declining property and sales tax revenues. In a press release, the Chief of the SEC Enforcement Divisionʼs Public Finance Abuse Unit summarized the SEC’s case: “We allege that Ramapoʼs senior-most officials concealed the true condition of the townʼs declining finances to avoid further political fallout from the construction of the baseball stadium”. The financial strain and desire to avoid further political fallout supposedly led St. Lawrence and the other defendants to conceal the true condition of Ramapo’s and RLDC’s finances. Specifically, the SEC alleged that the goal of the town bond fraud scheme was to mask the deterioration of Ramapo’s primary operating fund (the “General Fund”), in order to facilitate various bond financings of more than $300 million, including $85 million of new capital. The Complaint contended that the defendants’ materially false representations to investors and potential investors concerning the financial health and wherewithal of the Town constituted municipal securities fraud. Lawrence masterminded and directed a scheme to artificially inflate the balance of the General Fund by recognizing fraudulent receivables, omitting unpaid liabilities, and improperly recording transfers from other funds with different tax bases. Klein, the Town Attorney, aided in the town bond fraud by helping to conceal outstanding liabilities related to the baseball stadium and making repeated misleading statements to Ramapo’s auditors. Troodler, an assistant Ramapo attorney and former RLDC Executive Director, participated in the town bond fraud by certifying official statements that contained fraudulent receivables. Oberman, Ramapo’s Deputy Finance Director, joined in the scheme by, among other things, directing improper transfers from the Ambulance Fund to the General Fund. 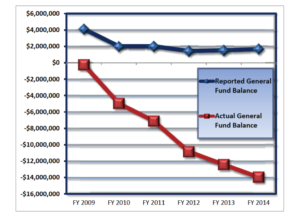 According to the SEC, the alleged conspirators’ false or misleading statements and misconduct made it appear as though Ramapo’s General Fund had a positive balance, when in fact it had a negative cash balance throughout the alleged relevant period. In its court Complaint, the SEC’s demanded a jury trial against Ramapo. This made it one of the few cases in which the SEC has sought a jury trial against a municipality. The first case ever in which the SEC pursued a federal jury trial against a municipality or one of its officers for violations of the federal securities laws involved the City of Miami (FL). That case was filed in court approximately three years before the Ramapo case, with the SEC winning a jury verdict in September 2016.